The Historical Commission is pleased to share the first publicly accessible digital copy of Biblical Doctrine by Moses M. Smart, published in 1843. This significant work by the educator and theologian from the New England Randall movement of Freewill Baptists predates Butler and Dunn’s Systematic Theology by a half century. It provides historians and researchers significant insight into early Randallite theology. The following excerpt regarding Dr. Smart is adapted from History of the First Century of the Town of Parsonsfield, Maine. Moses Mighels Smart Graduated from Waterville College, now Colby University, in 1836, from the Bangor Theological Seminary in 1839, and from the Central Medical College, Syracuse, New York, in 1850. He also read law, and in 1843, was admitted to the York County bar in this state. He, however, studied law and medicine, as sciences, and not with a view to the practice of either of them as a profession. He supplemented his theological studies at Bangor with a post-graduate course of one year at Andover, and in 1840 took charge of the Freewill Baptist Biblical School, then just established, and remained in charge of it for nine years. 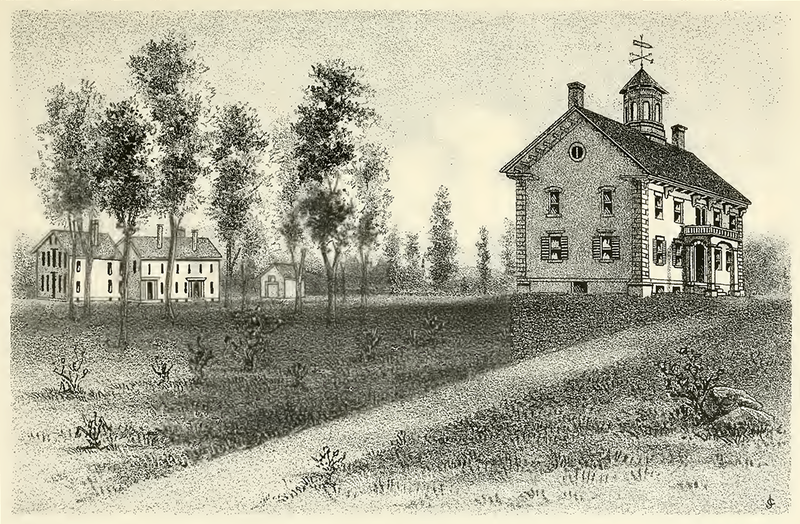 During that period the school was located, successively, at Parsonsfield, Maine (pictured above); Lowell, Massachusetts; and Whitestown, New York; and was the first theological school ever founded by the denomination. Verily such a life, now far into the seventies, must have been one of scrupulous, earnest, and incessant toil. Dr. Smart engaged in teaching and writing biblical works. Besides Biblical Doctrine, published in 1843, he published A Chronological History From the Creation of the World to the Present Century, Moral Philosophy, and Elements of Hebrew, Consisting of Grammar, Keader, and Lexicon. Dr. Smart died at his home in Whitestown, New York, October 2, 1885, at age 73. Ricker, Joseph. “Moses Mighels Smart.” History of the First Century of the Town of Parsonsfield, Maine. Portland, Maine: Brown, Thurston & Company, 1888, 62-63.